Gruber Veterinary Services was established in March 2013. After practicing for almost 10 years at a local clinic, Dr. Kim Gruber decided to start her own practice. The idea of a mobile practice was very appealing due to the fact that dogs and cats can be evaluated in their home setting. This allows for a different perspective in what may be the best medical care for these animals. Mobile veterinary care also allows for a less stressful experience for both the owner and the pet. This can lead to an increase in care for animals that may be difficult to get to a clinic setting. Being a mobile veterinarian also adds a convenience aspect for the pet owner. They do not have to take time from their busy day to transport their pet to a clinic. Overall, the pet and owner benefit from this unique feature. Dr. Kim Gruber was born and raised in South Bend, Indiana. She attended Washington High School and graduated in 1996. She obtained her Bachelor of Science while majoring in Animal Science from Purdue University in 1999. She also obtained her Doctorate of Veterinary Medicine at Purdue in 2003. 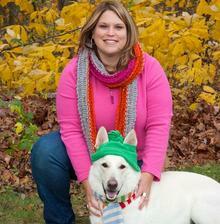 Dr. Gruber is the owner of a crazy, white German Shepherd named Thor. Thor is a very energetic dog that doesn't mind the torture of wearing hats and scarves for photos. She also owns Capote, a cat who is rather timid and shy and also Fitzy, a crazy kitten that is keeping the household on their toes. Hank, the Hackney pony, and JR, the Quarter horse, round off the crew. Dr. Gruber is an avid gardener on her 10 acre farm, Over the Top Acres. She is known to plant a ridiculous number of tomato plants each summer. She also has a 25 tree orchard, 4 strawberry patches, and numerous other berries growing. In what little spare time she has, she also is a potter and enjoys knitting.